Who knows where the whale vomited Jonah to…all we know is that his disobedience made things so much longer! He had to make a 3 day trip from his location to Nineveh. We see the number 3 again…hmm! See the Day 2 blog for more on the significance of the number 3. Why was Nineveh a great city? Why was Nineveh a great city? Was is great in size or specifically ‘great to God’? I believe it was both! More so the latter, the city must have been great to God for him to want them to repent and not perish, even to the extent of sending His anointed prophet by all means necessary…be it a whale! Actions speak louder…Faith without works is dead (James 2:14)! The people of Nineveh ‘believed’ God (verse 5), but that belief wasn’t enough, they fasted corporately and humbled themselves before God, physically showing their repentance and repentant hearts by putting on sackcloths. The KING of this great city also took part in the fasting, humbling himself by removing his robe and sitting in ashes. He also used his authority to instruct everyone in the land to fast, call out to God, and put on sackcloths. In Verse 9, the phrases ‘who knows’, ‘God may’, these words show that they were unsure if their action of repentance would have any positive outcome. But they still carried on…faith is a beautiful thing. CHALLENGE! : Why did the King give instructions for ‘beasts/animals’ to put on sackcloths as well? Feel free to tweet your thoughts about it! Repentance has a favourable consequence. God ‘relented’ of the disaster that he said he would do to them apart from repentance. Contrary to popular belief and lack of studying the Bible, we can see that God’s grace & mercy existed in the Old Testament! Grace is unmerited favour. Favour is receiving something you did not work for. Mercy is the withholding of what you do deserve! God’s mercy is evident in this chapter! 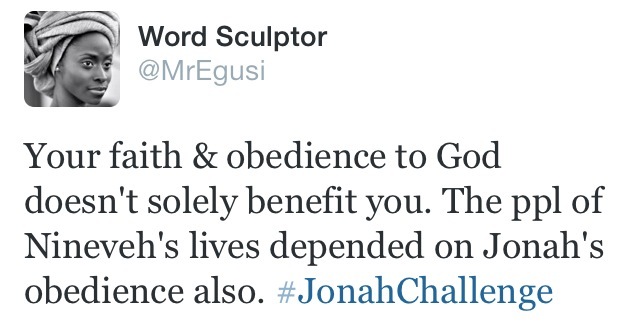 Your obedience can save a nation. Repentance can save a nation. And how shall they hear without a preacher???? Please ask yourself this question. Ask others this question. How will people hear about God if you do not tell them? How will people hear about God if we don’t support our missionaries & evangelists? How will people hear about God and be saved if you don’t grow in the faith, obey God and speak up? How?? See how a city was saved because Jonah finally heeded to God’s instruction. If he really resisted…the blood of the city would be on his hands, he would be held accountable. The people of Ninevah would have perished for lack of knowledge! But thank God that wasn’t the case. Understand that the things God tells us to do, the thing He considers to be our purpose has a greater impact. Purpose isn’t just for you! It’s for others to benefit from. You accomplishing your purpose is you being a point of provision for someone in ‘need’! You accomplishing your purpose and divine assignment is allowing someone to hear God’s word and get a chance to be saved! 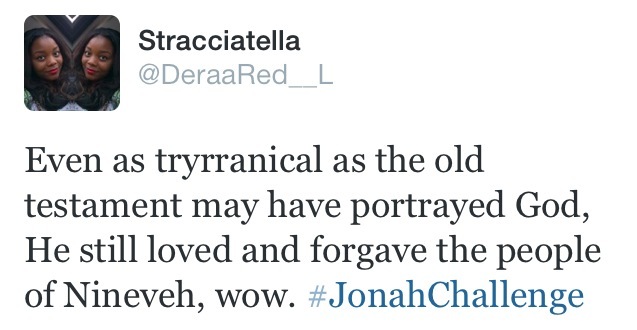 This was the case with Jonah, and I’ll give you an example using myself. My Testimony – an example that you are part of! 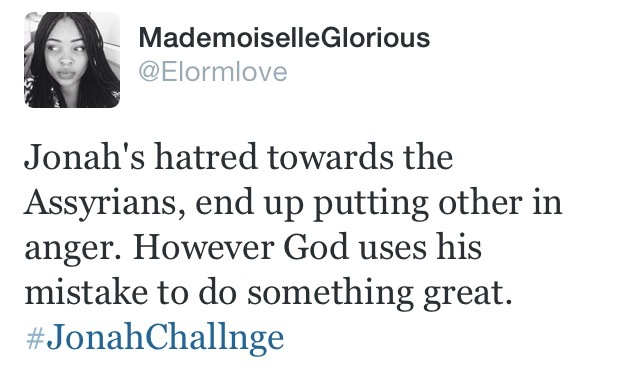 These bible challenges that I’ve created have allowed me to really understand my purpose. The vision came way back in February this year, I wanted to study the book of Esther by myself, but something in me – the Holy Spirit, told me to share it and see who else would be interested in studying the book of Esther. 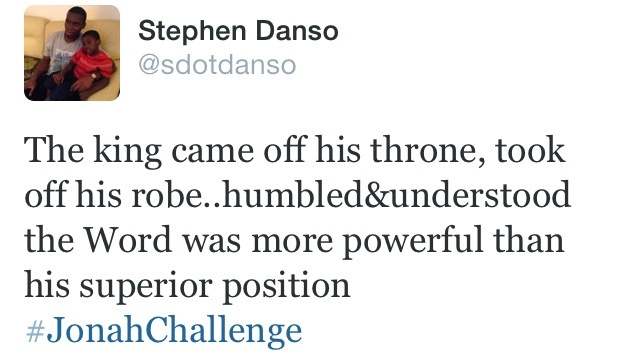 Lo and behold so many wanted to join me, going from 10 people to 50 and over 100 in the very first bible challenge. Since then I’ve facilitated 5 more bible challenges, this one being the 6th, with more to come by God’s grace. 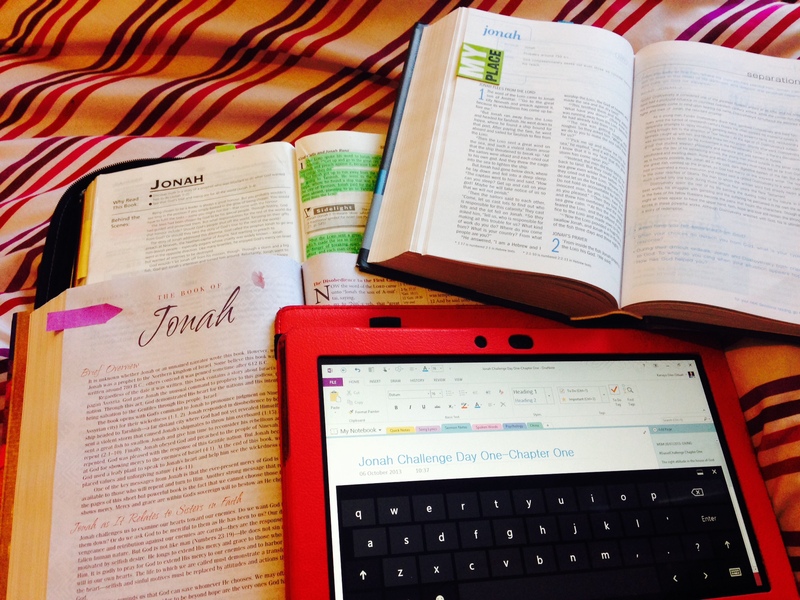 20,000 hits on my blog for these Bible Challenges! Isn’t God awesome! What if I ignored the non-invasive instruction of the Holy Spirit? How many people would have missed out on really engaging with the word of God? How would I have missed our on learning so much from you all? I love the change in verse 3 of this chapter compared to chapter 1. 1 : 3 – “But Jonah rose to flee to Tarshsish from God’s presence”. 3 : 3 – “So Jonah ‘arose’ & went to Nineveh, according to the word of the Lord”. Jonah finally obeyed! He listened and actively took on God’s instructions. Did it have to take being in the belly of a fish? Probably, probably not. When God instructs us, let’s obey. I know it’s easier said than done but it’s definitely possible. God who has chosen us for the task will definitely equip you and go ahead of you. 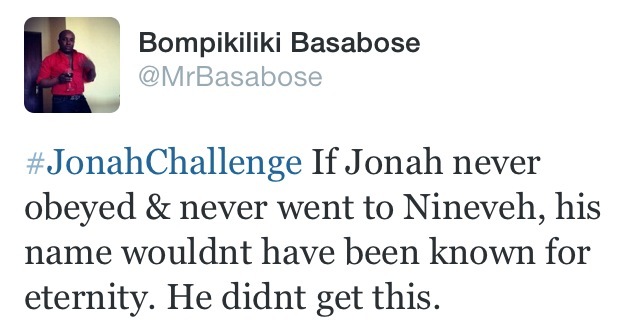 This is what I believe he did for Jonah. Jonah didn’t have to say much, it seemed like God had gone ahead of him to soften the hearts of the people so they could be receptive to the message. They immediately repented and asked for forgiveness. When God saw that they had turned from their evil ways, He was no longer angry with them. Jonah’s act of obedience had given some people a new lease of life. You don’t know who you can help or bring to Christ by simply obeying God’s instructions and sharing the gospel. The people of Nineveh obeyed and were saved from destruction. Obedience is better than sacrifice. ‘Arise, go unto Nineveh, that great city’ – same mission statement, same order in Jonah 3:2 as in Jonah 1:2. However the action Jonah took was different. In 1:3, the bible says ‘Jonah rose up to flee…from the presence of the LORD.’ However in 3:3, we see that ‘Jonah arose, and went unto Nineveh, according to the word of the LORD’. This brings to mind something Nelson Mandela said in his book ‘Long Walk to Freedom’ – he said ‘There is nothing like returning to a place that remains unchanged to find the ways in which you yourself have altered.’ We see this in action in Jonah 3:2, 3! Where before Jonah heard the Word, received his mission and fled as far as he possibly could in the other direction in chapter 1, now we see Jonah taking the Word without rebuke or challenge, and just getting on with it in humble obedience! It shows how much Jonah had developed, how much he’d grown, how much he’d come to understand that you can run but you can’t hide from God, how a calling from God is an awesome privilege to be embraced and not dismissed! 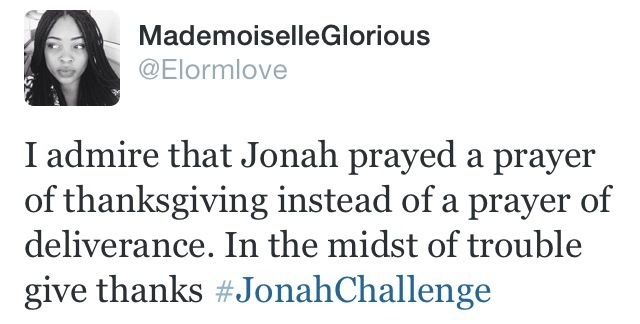 We see that over the course of a couple of chapters, Jonah has developed humility, his obedience has been nurtured. Sitting in the belly of the whale was not a punishment, but it was what many of us need – a place of solace and silence, to just STOP, and take stock of life, away from the noises of the world and the people around us, in order to GROW and be made ready for our mission in life! Jonah’s commitment to his task is evident in the fact that he goes a days journey into a city where his message should be hated. He doesn’t preach from the edge of the city so that he can turn and run if it gets hard. No, he really gets stuck in. I think this chapter is very important for the evangelist. As Christians we were all commissioned by Christ to go and spread the gospel message (Matthew 28:19-20) therefore we all have something to learn. We often think that we are inadequate to convert people because we have been through periods where we doubt and challenge God, phases where we deny Him and are disobedient but the truth is that we are all competent to do God’s work – “and all of them, from the greatest to the least, put on sackcloth” (verse 5). This same Jonah from chapter 1, was able to save the souls of a whole city, despite his actions before he started preaching. When we realise this, that we are personally and individually chosen, we can be encouraged that God knows who he has chosen and better still, has confidence in who he has chosen. 3:5&6 – It seems as if everyone including the king realised the importance of this message. Also the fact that Jonah was so slow to deliver the message yet this whole city were so quick to accept it. Imagine if he never went to Nineveh, a load of willing people would have just been destroyed none the wiser. 3:9 – This again mentions God’s grace & mercy just like in Jonah 2. This chapter of Jonah continues in the theme of the sovereignty of God to do His perfect will, but it also shows us that salvation was no different in the days of Jonah than it is today. It is by grace, through faith that the Ninevites were saved. We do not have to have full understanding in order to serve God; we simply must be willing. God has a plan for each and everyone of us, so instead of trying to figure out the way he is working just have faith so can use you more- “Trust in the Lord with all your heart and lean not on your own understanding”- Proverbs 3:5. 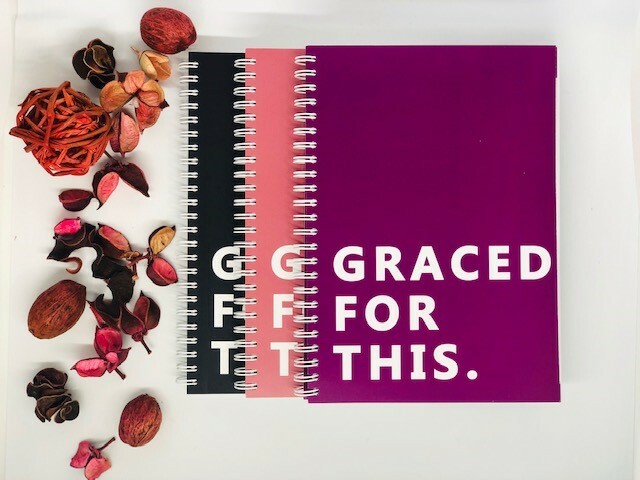 God told Paul, “My grace is sufficient for you, for my power is made perfect in weakness.” In response Paul wrote, “Therefore I will boast all the more gladly about my weaknesses, so that Christ’s power may rest on me. That is why, for Christ’s sake, I delight in weaknesses, in insults, in hardships, in persecutions, in difficulties. For when I am weak, then I am strong”. God is proof of our repentance of sin. God never set out to form a legalistic society that would “not sin;” instead He wants people to do His work. “So whatever you do, do it all for the glory of God” -1 Corinthians 10:31. I’ve told some people all the time to quit worrying about what might be sin and focus instead on how what you are doing glorifies God. If all we do glorifies God then we are not in sin. – God is merciful. 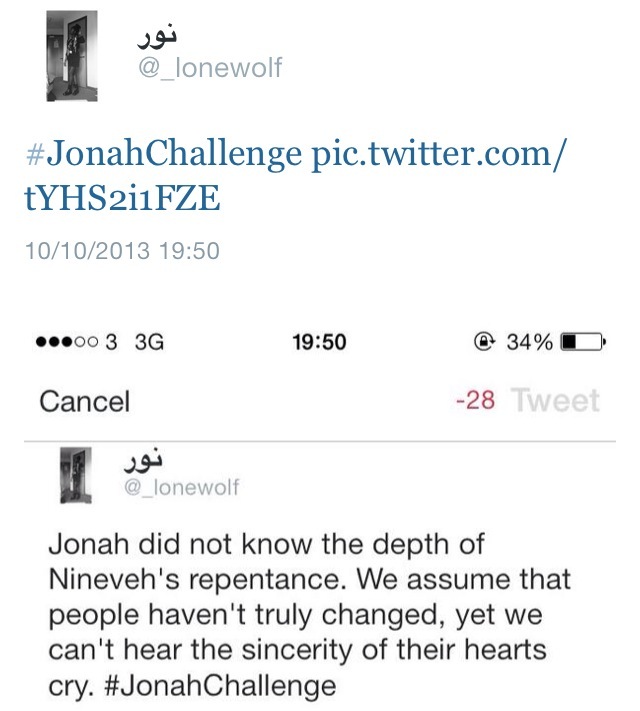 He gave Jonah a second chance to do the task which he had originally failed to complete. – Verse 6 says “When the king of Nineveh heard what Jonah was saying, he stepped down from his throne and took off his royal robes…”. This shows that the King was truly humbled, and understood that God’s Word was far more powerful than his superior earthly position. – We see that prayer, fasting and repentance moved God. Verse 7 shows that the whole city was ordered by the king to do a dry fast (not even drinking water). The verse above in the two different versions show that although they were called to COLLECTIVELY repent as a city (“their”), that repentance is a PERSONAL thing (“his”); everyone had to “pull their own weight”, so to speak. “Once again…” Our God is a God of many chances not just second chances but many chances! He wants the best for us, like it says in the bible that He will not withhold anything good from happening to us. He never gives up on us! We shouldn’t give up on him either no matter how hard it gets so we need PERSISTENCE! There are times when we need to ask The Lord for him to touch us ONCE AGAIN! To show up and show himself in our lives ONCE AGAIN! Sometimes we just need another touch. Jonah obeyed God the second time, just because God gives us many chances we shouldn’t take advantage of it. It took Him three days to walk through Nineveh. Jonah was in the fishes belly for three days. Jesus was in the grave for three days. The three days in these situations is significant! Why? Because the three days that Jonah was inside the fish he was going through a process of transformation.’May we be transformed through the renewal of the mind’ During his three days of walking through Nineveh people’s minds were transformed. At the end God’s glory was seen. When Jesus rose from the grave God’s glory was also seen. The sack cloths were a symbol of humbling themselves before God. Even the King wore a sack cloth which shows that everyone is equal so no one is too prestigious to be humble. We should always be humble even when we ask for forgiveness from God or anyone for that matter. Why should we be doing evil in the first place then when God said destruction is coming we then want to turn away from our evil ways because we know the consequences of our actions. We shouldn’t leave it too late to turn away from our sinful natures. God is never please by our wrongs but he is pleased when we turn away and face him instead of allowing our fleshly ways to get the better of us. “Once bitten, twice shy.” Jonah was aware of what was waiting for him if he didn’t obey The Lord the second time. God often tells us to do things, but we don’t. He is a patient God, I know. But it will get to a point where He would pour out His wrath on us and that’s something absolutely terrible. amazing what The Lord does! The people of Nineveh were wicked people who always sinned against God.. 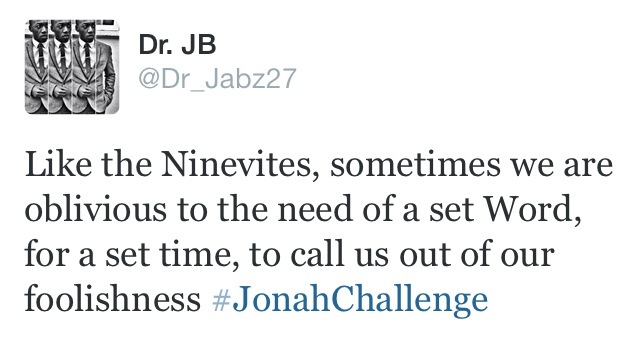 But at the announcement from Jonah, their hearts melted. that, but for a King to do that, then he must have been sorry. When we get too carried away & do things our ways, God does some certain things to humble us. Their sober attitude saved them from God’s wrath. What if they continued with their evil aways even after being warned? It would have been a different story.